7 Hills of Kirkland: Where’s the end of this $^%#@! hill? In response to the question raised in my last post, will the 7 Hills of Kirkland ride be hillier than the Chilly Hilly, the answer is … yes, indeed. But I won’t complain. I actually had fun, resembling the Slowskys as I trudged up those hills. And, to gain some perspective, a few hours after the ride I attended the premiere showing of the new documentary, “The Long Ride Home.” In it, my friends Kevin Mincio and Matt Sauri talk about riding 4,200 miles across the country (up the Sierra Nevadas, Rockies, etc.) to bring national attention to the plight of families of fallen soldiers. After knowing what they went through, on behalf of people who fought for our freedom, it’s hard for me to whine too much. 1. Market (210 feet of elevation): You tackle Market Street going north right after leaving the start at Marina Park in downtown Kirkland, and it isn’t a huge challenge. But it gets you warmed up. 2. Juanita (285 feet): Feel this one a tiny bit more in my quads. This hill concludes at Holmes Point Drive N.E., and then we ride down, down, down in a huge descent. I haven’t been to these parts along northeast Lake Washington since covering a house fire for the Bellevue Journal American in the late 1980s. The downhill sprint is ominous, however. There is some bigtime climbing ahead. 3. Seminary (455 feet): Boy, do I labor up this twisting, turning hill. It seems like we are going up some logging road in the middle of a national forest; there are only trees (and slow-riding bicyclists) as far as you can see. Finally, I get to the top and see the civilization (OK, strip malls and convenience stores) of Juanita Drive N.E. It is good to leave the Finn Hill/Seminary Hill forest behind. It looks like other, faster riders need a rest. I keep going. 4. Norway (475 feet): This hill in Bothell is preceded by another downhill taking you into Kenmore and onto the Burke-Gilman Trail for a flat stretch. Out of that, you then go through some Bothell neighborhoods, and take a sharp right turn uphill. This hill seems to level off, then keep going, then level off, then keep going. Just when you think you’ve reached the top, there is more. Finally, it crests, but you feel the course designer is playing with your mind a bit. 5. Kingsgate (412 feet): Back in Kirkland now, this hill is favorably broken up by a food stop. You are dropped onto N.E. 132nd Street, which takes you under I-405, then up the other side to the food stop at a local school. They have big chocolate chip cookies, brownies, bagel halves with peanut butter, and other good stuff. I get the last cup available for water and Gatorade. It is 17.8 miles into the ride, but four and a half hills are done, and I need the stop. Getting to the top of Kingsgate Hill is no big deal after getting reenergized at this stop. 6. Winery (390 feet): Now this is a hill that seems to be thrown in for effect. I can hear the course organizer laughing to himself as he includes it. You’re riding flat along Woodinville-Redmond Road south, and then you detour right into this steep, unnecessary climb into a view-property subdivision. Chalked on the street at the bottom of the hill is “Shift into low gear.” And then, “Enjoy!” followed snickeringly by a smiley face. Yes, the joke’s on the riders. It’s a tough hill, but I persevere and make it to the top in the lowest of all my gears. 7. Rose (525 feet): After that last hill, you still have 15 miles and another food stop — but only one major hill — remaining. You go downhill from 132nd Avenue N.E. to Willows Road and follow that through Redmond to West Lake Sammamish Parkway and then Old Redmond Road. This last hill has the most elevation of all seven, but it’s manageable because you climb it over three miles. It’s a slow grind to the top, but not hardly as steep as Winery, Norway, or Seminary. Then you get a downhill through Bridle Trails, leading to a flat finish along Lake Washington Boulevard back north to Marina Park. This course took me four hours (10 mph pace), not counting time at the food stops (the same stop is there for you twice on the course). Unlike marathons and other road runs, no one is there clapping for you when you hit the finish line. In this ride, no one even notices when you finish. But that’s OK. Volunteers serve strawberry shortcake to all finishers, and that is good enough for me. Plus, the ride is a benefit for a local charity helping the homeless. I may be sore and spent (no ankle problems), but I’m ready to do another one soon. In fact, I just signed up to do the Flying Wheels 65-mile ride on June 9 (less than two weeks away). My longest ride to date is 45 miles (the Harvest Century last October), so this won’t be easy. But it has only two major hills — allegedly. Can’t wait. Thanks for reading. Till next time. This entry was posted in 7 Hills of Kirkland, Bicycling, Chilly Hilly, Flying Wheels, Harvest Century and tagged 7 Hills of Kirkland, Bicycling, Burke-Gilman Trail, Chilly Hilly, Flying Wheels, Harvest Century, Marathons, Marina Park, Running. Bookmark the permalink. 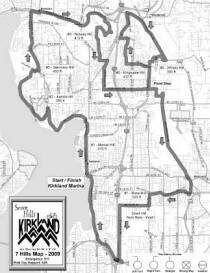 5 Responses to 7 Hills of Kirkland: Where’s the end of this $^%#@! hill?